Demolished After a Long Siege in 1646. QUITE recently I met a puzzled man from Pilling. He had been pulling down an old cottage. The walls were of the common type, shells packed with rubble, and the beams were black oak pinned with wooden pegs. In part of the construction, however, sandstone had been used, and he did not know its origin, because there is no such stone in the village, and at the time when the cottage was built the materials nearest at hand were always utilised. 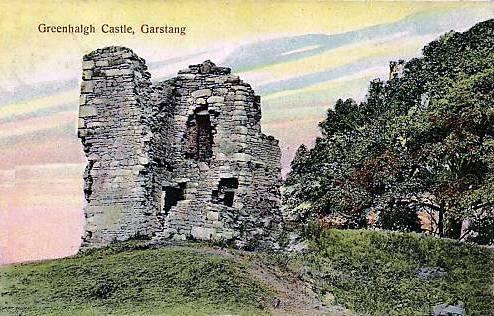 I said that perhaps the stone came from Greenhalgh Castle, just outside Garstang. When the castle was demolished in 1646, and only the present stump left standing, a good deal of the material was used for building in the district, and as years went on it was almost all taken away. The events that preceded the demolition of Greenhalgh Castle are so interesting that I am surprised they are not more generally known. The castle was built by the Earl of Derby in the time of Henry VII, when the barons were still a power in the land. The buildings were in a rectangle around a great central courtyard, and there was a tower at each corner. At the foot of the hill on which the ruins stood was a swamp, supplemented by a moat for which it supplied the water. The swamp has been drained for many years, but you may still trace the site of the moat. The country it commanded, I suppose, has changed less than the castle. Then as now the young Wyre wound out of the hills, where wooded slopes rose to the blue fells, and old Garstang town lay down in the hollow. Leland, that indefatigable traveller who went everywhere and wrote down what he saw, visited Garstang on a May day in 1535, and noted a "pretty castle of the Lord of Derby's." The siege of the castle, which began in 1846 and ended in its destruction the following year, was recorded by a Puritan writer of the time, and further traces of it may be found in the registers of Churchtown Church. The war between King and Parliament had been dividing the Fylde for some time when, on a day in May, 1645, Captain Nicholas Anderton. of Claughton, whom our chronicler describes as " a most desperate Papist," took possession of the castle and stayed there. "Colonel Dodding with his regiment, with Major Joseph Rigby's cannons, laid close siege to Greenhalgh Castle, keeping their main court at Garstang town.
" Into the castle were gotten many desperate Papists. Their governor was the one Mr. Anderton. They vexed the country thereabouts extremely, fetching in the night many honest men from their houses and making a commodity of them. They sallied out oft, and killed some. "They stood it out stoutly all through the winter. The country was put to extraordinary charges in maintaining the men, who made a prey without pity, such an abundance of provision they weekly destroyed. "The leaguers thought to have undermined the castle and blown it up with gunpowder. At great cost they spent much to pioneers, but to no effect, for the ground was so sandy that it would not stand. "At last this Anderton died, and they through watching being thereby discouraged. they were glad to come to a composition to deliver the castle up upon conditions. which were that they should go to their own houses and be safe. "It was ordered that the castle should be demolished and made untenable, and al the timber taken out of it and sold. which was done. And so it lies ruinated.
" It was very strong, and built so that it was impregnable with anv ordnance whatsoever, having but one door into it, and the walls of an exceeding thickness and very well secured together." You can still see how true his words were. 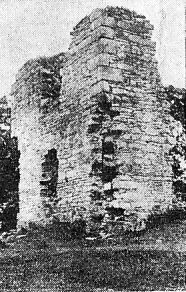 There are the remains of a tower 24 feet square, made of rubble sandstone, and the walls are five feet thick. You may stand on the hill and look down to the town, imagining how the attackers came up those same slopes, and how the defeated garrison later walked down them. You may think also of the castle 100 years before that, as Leland saw it when he crossed " the great stone bridge over Wyre."